Autumn is unmistakably here. There’s a cool crispness to the sunny days and the shops are groaning with harvest produce, including gorgeous fruits like apples and its close cousin, the quince. Looking like an apple crossed with a pear, it’s well worth getting past the downy skin of this beautiful fruit to taste its perfumed flesh. It goes well with apple or pear in a crumble or cobbler or is wonderful roasted and served alongside roast pork, but I wanted it to be the star of the show this season so am using it on its own. It is often used to infuse brandy for a rounded slightly sweet but floral drink that warms the cockles on a winter’s night, but I don’t like brandy, so I’m subbing dark rum instead. 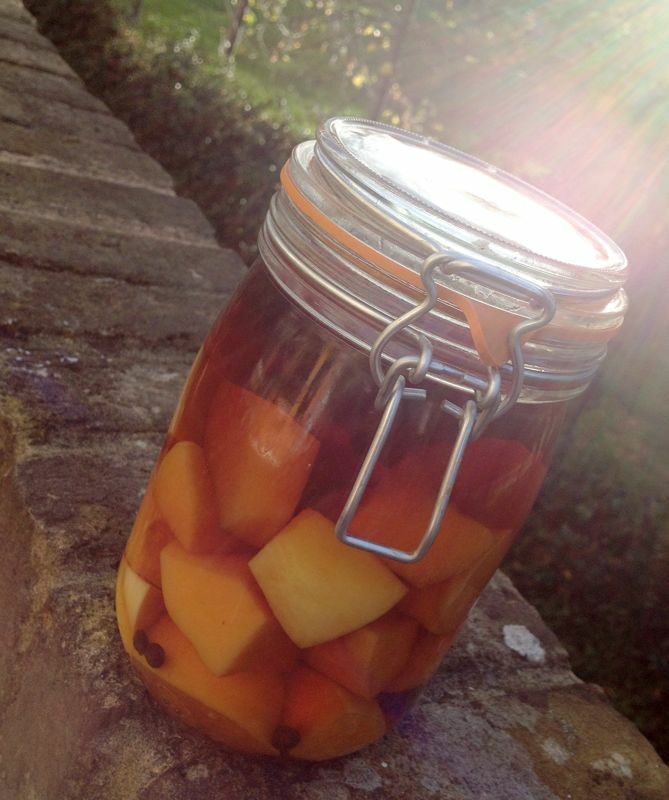 Incredibly simple to make, it sits and infuses for around six weeks to keep the spirit of autumn alive as the light fades completely around Christmas. First find your quinces. If you know someone with a tree, make them your new best friend and never let them go. Otherwise, pop to the Portuguese deli on Atlantic Road and buy some at an extraordinarily good price. Then go to Morleys and buy a mid sized La Parfait glass jar with the snap top lid. I usually pop into Marks and Spencer and buy a bottle of their own brand rum for this as it’s not bad quality but much cheaper than any of the branded bottles you can get. You are adding lots of flavour so you don’t need something premium here. Pour the rum over it all and close the jar fully. Then set aside and allow to infuse for at least six weeks. At that point, drink the fruits of your labour. It makes a lovely nightcap as it is or can be added into cocktails for an unusual twist. It also makes excellent Christmas presents so it’s useful to make more than you think you need and revel in its deliciousness and your new found organisation!